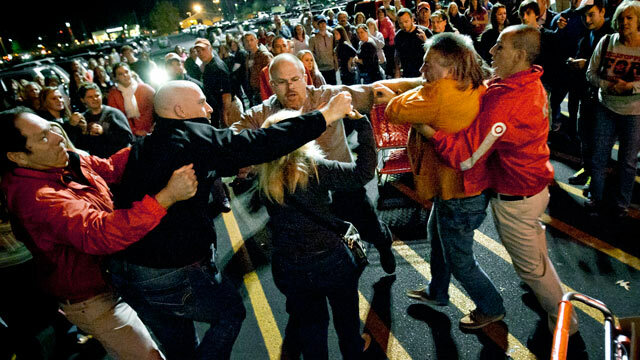 Black Friday Violence: 2 Shot Outside Walmart, Scuffles Across U.S.
Two people were shot outside a Walmart in Florida today, one of a rash of fights, robberies and other incidents that have cropped up on one of the most ballyhooed shopping days of the year. The shooting took place at a Walmart in Tallahassee about 12:30 p.m., said Dave Northway, public information officer for the Tallahassee Police Department. Investigators believe a scuffle over a parking space outside the store escalated into gunplay leaving two people shot. The two victims, whose names and genders have not been released, were taken to a hospital with what are believed to be non-life threatening injuries. Police are looking for a dark green Toyota Camry in connection with this case. At a Walmart parking lot on Thanksgiving night in Covington, Wash., two people were run down by a driver police suspected of being intoxicated. The 71-year-old driver was arrested on a vehicular assault charge after the incident, spokeswoman Sgt. Cindi West of the Kings County Sheriff's Office said. The female victim, whose identity has yet to be released, was pinned beneath the driver's Mercury SUV until being rescued by the fire department. She was flown to Harborview Medical Center, where she was listed in serious condition, West said. The male victim was also taken to Harborview Medical Center, where, West said, he was listed in good condition. Tensions were high at the entrances as people lined up outside stores, waiting for the doors to open. At a San Antonio, Texas, Sears, one man argued with customers and even punched one in order to get to the front of the line, prompting a man with a concealed carry permit to pull a gun, said Matthew Porter, public information officer of the San Antonio Police Department. "It was a little chaotic. People were exiting the store," Porter said. "Fortunately for us, officers responded quickly and were able to ease the commotion." The man who allegedly caused the altercation fled the scene and remains at large, Porter said. The shopper who pulled the gun will not face charges, he said, because of his concealed carry permit. One man was treated at the scene for injuries sustained when people rushed out of the store, Porter said. The crush of shoppers in the middle of the night were prey once again this year for thieves, who hid out in parking lots. In Myrtle Beach, S.C., a woman said a man pulled a gun on her just as she exited her car to go inside a Best Buy store. The thief made off with $200, according to a police report. In Maryland, 14-year-old boy told police he was robbed of his Thanksgiving night purchases by five men in the parking lot of a Bed Bath and Beyond store early this morning, the Baltimore Sun reported. And in Massachusetts, Kmart employees tried to locate a shopper over the intercom after a 2-year-old was reported to be alone in a car, ABC News affiliate WCVB-TV reported. Police arrived to break into the car and remove the child. The boy's caretaker, his mother's boyfriend, denied the incident took place, according to the station, and was not arrested.